Your photos are visible on your gallery as soon as the transfer is done. Could it be easier? * 0001417: [GUI] Ability to set tags for a photo selection. 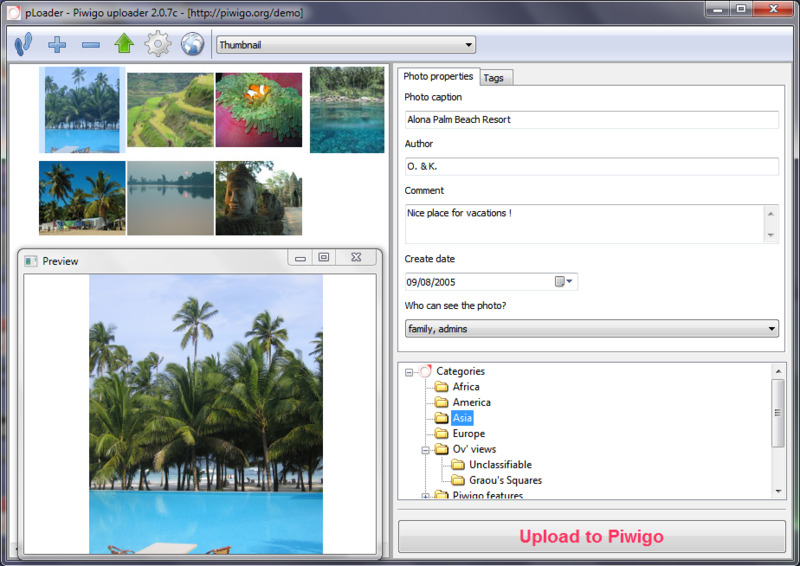 * 0001414: [GUI] Improve Photo properties panel by adding a notebook and a big upload button. * 0001395: [GUI] Use a toolbook widget in Global settings dialog. * 0001410: [GUI] pLoader may crash when adding or uploading photo is cancelled. * 0001066: [configuration] unexpected behavior on resizing. * 0001069: [GUI] too many photos automatically removed from selection. * 0001403: [GUI] Re-upload management choices are overridden by default values. * 0001367: [configuration] Close after refresh category. * 0001394: [preparation] Auto rotate is not disabled when required. * 0001370: [GUI] Broken watermark selection for color and position. * 0001400: [preparation] Remove pLoader resized image file cache. * 0001389: [GUI] Remove AUI docking manager. * 0001388: [GUI] Refactor getting started panel. * 0001369: [configuration] Remove relative path for resources and locale catalogs. * bug:1234 [communication] Some security policies prevent pLoader from connecting with user agent "libwww-perl"
* bug:1067 [GUI] missing error message on "Communication error with"
* bug:1139 [GUI] French Language "Connexion"
* feature:1021 [configuration] automatically add "http://" to the URL if it doesn't start by "http"
- 0001530: [GUI] Display an add button in categories list when it is empty. - 0001496: [GUI] Display a message in the photo selection when it is empty.